GREENSBORO, NC – March 21, 2019 – Fresh-food focused specialty grocer The Fresh Market is helping make Easter entertaining eggstraordinarily elegant with offerings like luscious rack of lamb, standout standing rib roasts and classic honey hams, paired with a fresh crop of seasonal spring vegetables (like in-season-for-a-hot-minute fiddlehead ferns). Chocolate Dream Cake (7 in): Rich chocolate cake layered with chocolate mousse and chocolate cake crumbs. 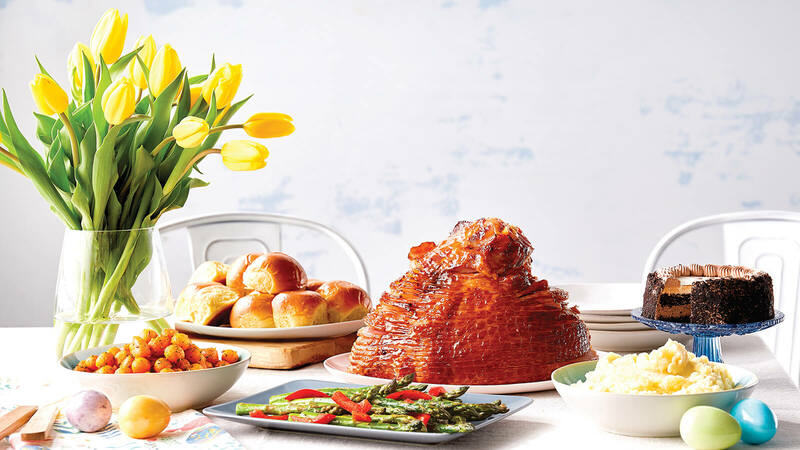 The complete meal is available for $69.99 and can be ordered in-store or online by 2 PM EST on April 17th for pickup Easter weekend. Other centerpiece-worthy main dishes can be found in the meat department, including succulent rack of lamb, available seasoned or unseasoned. Another holiday standout is the standing rib roast, available in both USDA Prime or Premium Choice cuts. The Fresh Market’s expert butchers are on-hand to custom cut and trim it to meet your needs. Loison Colomba panettone: Buona Pasqua with this traditional Italian Easter cake made in the generations-old style that requires a full 72 hours to make. Available in mandarin or peach with hazelnuts. Comes in a beautifully wrapped package that makes a perfect hostess gift. Hot Cross Buns: These classic Easter pastries are made from yeast-raised dough carefully crafted into a soft, chewy bun filled with candied fruits topped with a white cross of icing. Spring-Flavored Specialty Coffee: No other retailer offers the seasonal flavor coffee variety as The Fresh Market. New varieties for spring include Carrot Spice Cake, Wild Blueberry Pie and Spring Blend with notes of caramel, vanilla and butterscotch. Round out the Easter table with Rosé wine and fresh cut flowers from the floral department. The Fresh Market’s candy section also features gifts for little and big bunnies alike, including imported chocolate bunnies and eggs, truffles, jelly beans and gummies. For guests celebrating Passover (April 20 – 27), The Fresh Market is elevating this holiday with double the Kosher for Passover offerings including meats and cheeses (select stores), wines, chocolate Seder plates, red velvet and carrot cake flavored macaroons, Israeli and Middle Eastern spices like Za’atar and Sumac, even gluten-free matza meal and mini matza bread for kids. Visit www.thefreshmarket.com/passover for more information. For consumer questions, please contact our Guest Care Team. Since 1982, The Fresh Market, Inc. has helped guests make everyday eating extraordinary with time-saving meal solutions, unique ingredients and delicious food for any occasion. From fresh produce and exceptional meat and seafood, to signature baked goods and thousands of organic options, this specialty grocery retailer has something to please every palate. The Fresh Market currently operates 161 stores in 22 states across the U.S., inspiring guests to discover new flavors and cook with confidence. For more information, please visit www.thefreshmarket.com or follow the company on Facebook, Twitter and Pinterest.